What if Microsoft disappeared overnight? Microsoft is the top dog of tech firms. Its operating systems have guided the evolution of home computer use for over 30 years. It's hated, loved, mocked and praised in roughly equal measure. It's even powerful enough to turn its nose up at the US government. What happens then if, suddenly, it dies? If you wake up one morning and there's no Windows, no Internet Explorer, no MSN, no Office, no Bing… it's all just gone. We know it's not likely to happen soon, and we know Microsoft is rather well off financially at the moment, but every empire ultimately crumbles. Just how would the world react if there was no more Microsoft? We've enlisted the help of futurologists and top technology analysts to help us describe a world without Gates, Ballmer and Windows. First, let's get an idea of what we're dealing with. Microsoft is the third largest company in the world. The brand is a household name: the yearly Millward Brown study into the most powerful global brand names put Microsoft at number two in 2009 (with its brand valued at $76million), beaten only by Google. Remember, that's not just tech – that's everything. Microsoft's name is more recognised by people across the world than McDonalds or Coca Cola. This isn't so surprising when you consider that Net Applications calculates that Microsoft's operating systems were being used by 93 per cent of computing devices in May 2010 (or at least those that connect to the internet). The various Mac OSes had only a five per cent market share, with Linux at a measly one per cent. Windows runs government systems, hospital computers and global financial infrastructures – its reach is immense and its pockets are very deep. Then there's what Microsoft means to most people. For many it represents computing. Those without an active interest in technology often believe that Microsoft Windows is the computer. That's the kind of brand association you won't see with any other company, and it makes it a very powerful force in the technology world. But despite all this, suddenly, one day Microsoft disappears. It would take a series of very unfortunate events for the company to be gone overnight – and the scenarios that could cause this are rather hard to imagine. To completely wipe it out would take an unimaginable event: something like a potent version of the millennium bug striking 10 years later than expected and managing to wipe out every Windows operating system across the world, while meteorites take out all the global archives of all its software and everyone's back-up discs spontaneously combust. As we say, it's unlikely. But however it's achieved, Microsoft is gone and there can be no rescue. What would be people's first reaction to the loss? Rob Enderle, Principal Technology Analyst of the Enderle Group, says it would be panic: "It would depend on how fast the incident occurred and how much time people had to get ready for it. I'm assuming 'suddenly', and in such a case it would probably crash the NASDAQ, which might take many of the other markets with it in a kind of a rolling collapse. 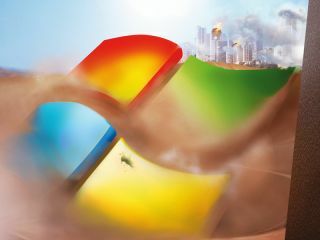 Microsoft is likely a firm that is even higher on the 'cannot fail' list than the auto companies and most of the banks." Futurologist and technology researcher Robert Mannings agrees: "If it was a failure like we have seen in the worst days of the credit crunch then, yes, there would be panic. Stock markets would fall based on the belief that many businesses would be adversely affected. Think of the chaos of the illusory millennium bug and the current financial woes that are caused largely by fear of loss rather than actual loss." Both agree that with some warning, the reaction would be a lot calmer. As Mannings explains, "The software world moves quickly, and if it was clear that the company was doomed for some reason then it would not take very long to fill the void." Who would benefit from the titan's fall? "In the short term, everyone would be a loser if the failure was rapid or catastrophic, since stock markets would fall too," says Mannings. "Rivals such as Apple and many big software houses would win business as some rapidly replace systems. In the longer term, everyone would be winners, as there is something of a monopoly about Microsoft – filling the vacuum are likely to be many players with more competition and thus lower prices and more innovation." It's clear that there would be massive shifts in power in the technology world. "Pressure would be taken off Google and Apple," believes Enderle, "but both firms are increasingly focused on each other anyway so their benefit would be reduced. Interestingly, since Microsoft's Zune and Bing efforts are likely preventing Apple and Google from being branded monopolies, these two firms might actually not have a net benefit at all, but instead be hit indirectly by successful anti-trust action if Microsoft failed. The most critically hit of course would be firms that survive by selling Microsoft software and related services." He also tries to envisage the impact Microsoft disappearing would have on the financial world: "Microsoft is widely held as an investment in retirement and investment funds which, depending on the level, could be badly hurt were the company to fail. Clearly, Bill Gates' own charitable efforts would be hard hit. "The US would be hit very hard financially and this alone could shift much of the technology power in the world to China depending on how quickly and effectively China prepared for the event. Much, if not most, of the world's technology manufacturing is already in that region."